Welcome back to Swatch Saturday! Today’s swatch is a gorgeous glitter jelly from Blue-Eyed Girl Lacquer. This is Noticing Face, and it’s one of my favorites from their massive Doctor Who collection. Yes, I’m still working through it! I’m wearing three coats of Noticing Face with one coat of Seche Vite top coat. 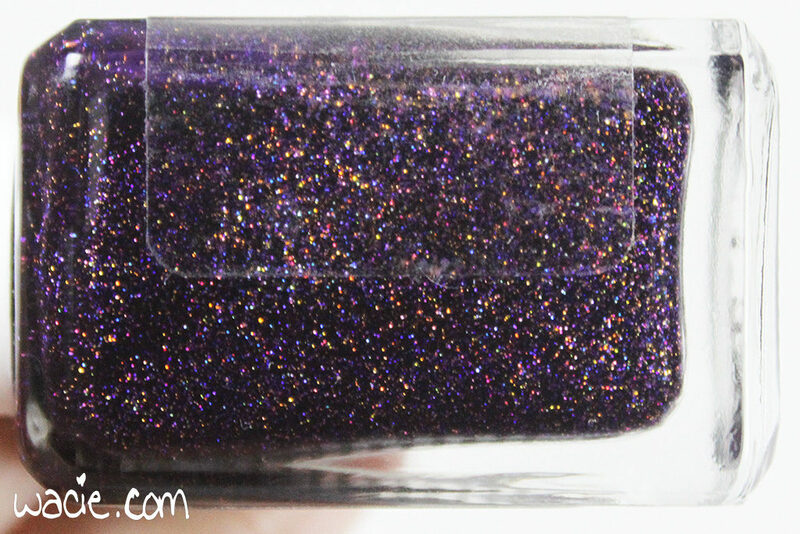 Noticing Face is a deep purple jelly with fine gold and purple holographic glitters. Application was easy; the product consistency was very nice to work with. The jelly isn’t streaky or too thin, but is still thin enough to let the glitter show through. My first coat was nearly full-coverage, which, how often does that happen for you with a jelly? The second coat evened everything out. The fine glitters dry with a slightly gritty feel, and the jelly had a slight satin finish when dry. I used top coat for extra shine and smoothness. This could be the most perfect glitter jelly I’ve ever used. The color is deep and still squishy, and the glitters add sparkle without overwhelming the polish. The gold glitters in particular are my favorite, adding a complementary element that’s still luxe and natural. It’s gorgeous. My outdoor photos don’t do it any justice, but of course, when I took these photos, there was a hurricane outside and it wasn’t very sunny. These photos were taken in mostly cloudly, somewhat hurricaney conditions. Noticing Face and other BEGL polishes are available in their online shop, though at the time of this writing, they are taking a break. This entry was posted in Swatch Saturday and tagged Blue Eyed Girl Lacquer, glitter jelly, indie, purple, swatch. BEGL is quickly becoming one of my favourite brands! Such a pretty purple! You are such a BEGL fan! 🙂 I believe I have one that I got in one of the recent color boxes! 🙂 I’m excited to try it! That colour is just gorgeous! This is so pretty! I think I skipped this one but shouldn’t have! So pretty! And perfect for fall and Halloween. This is gorgeous!!! I totally could see a fun Halloween mani using this shade!